We've been off the trail for two full days. My knees and hips feel normal, but my feet and calves have a different story to tell. It makes sense; they don't often get put through what I put them through this past weekend. All told, we covered just under 34 miles, gaining and losing 9,000+ feet of elevation on the Pemi Loop. It's a special collection of trails in New Hampshire, traversing three mountain ranges (Franconia, Twin, and Bond), covering eight summits, and featuring some of the most spectacular views in the Northeast. The eight summits are all well above 4,000', which might not sound like much, but it does when you start from near sea level to reach them. And it's not often you get to spend time above treeline around here, much less extended time above treeline on one knee-buckling, quad-busting trip. 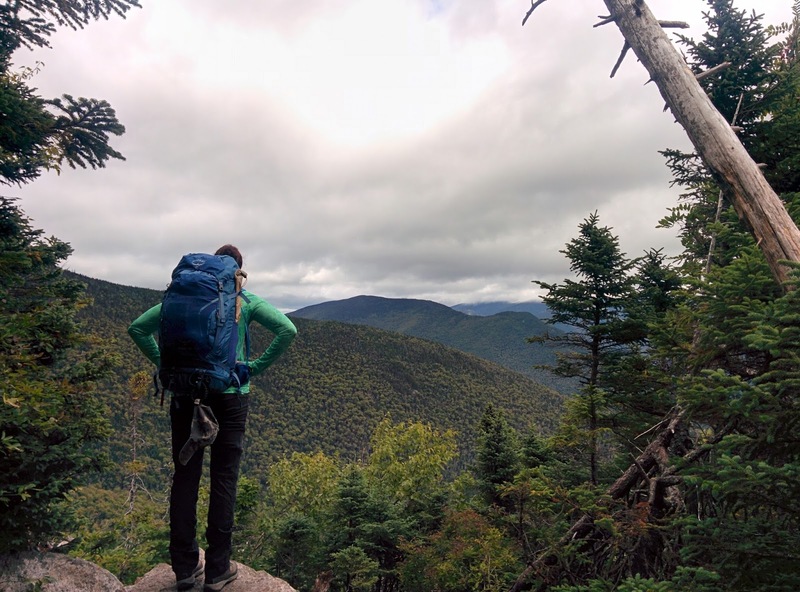 A friend told me about the Pemi Loop years ago, but the distance from home (seven hours without traffic) and level of difficulty kept the trail on my bucket list, until now! We drove up from Philadelphia, spent the night at the adorable Shamrock Motel, and stuffed our faces with homemade muffins from the continental breakfast the next morning. We pulled into the Lincoln Woods Visitor Center parking lot, paid for three days, and started the Pemi Loop around 8am, heading clockwise. Setting off under cloudy skies with a stiff breeze and mild temperatures was wonderful, though the predicted drop below freezing at night meant I kept my down jacket handy. 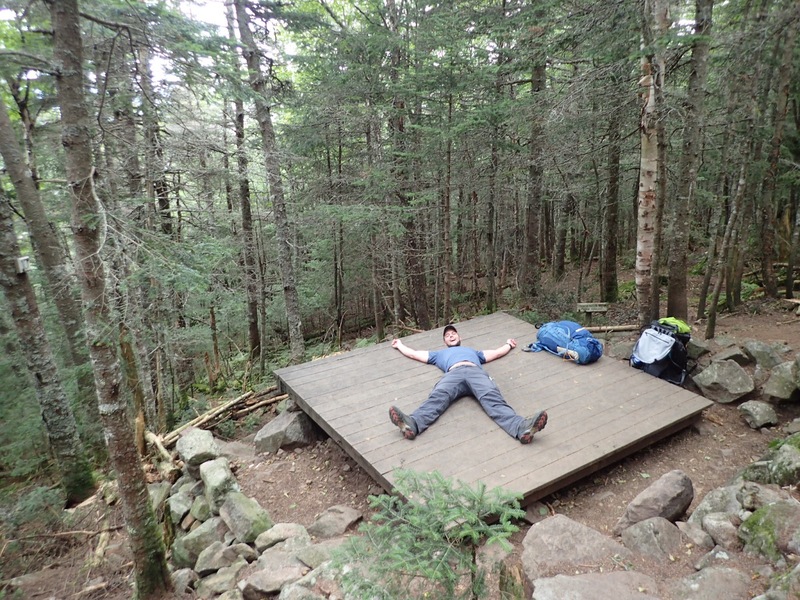 The Lincoln Woods trail follows the east branch of the Pemigewasset River after crossing it on a suspension bridge, and we turned left on to the Osseo Trail after 1.4 miles to begin the real climbing for the day. The Osseo Trail ascends at a consistent rate and eventually up a series of strategically placed ladders. We stopped at a "downlook" for peanut butter and jelly sandwiches, then continued up the last steep section. My partner in crime was a few steps ahead of me, and as he popped out of the trees on to the Franconia Ridge Trail near the summit of Mt. Flume (4,328'), I heard him yell, "Woah!" I followed, and was nearly blown off my feet by gusts of wind coming from what felt like all directions. 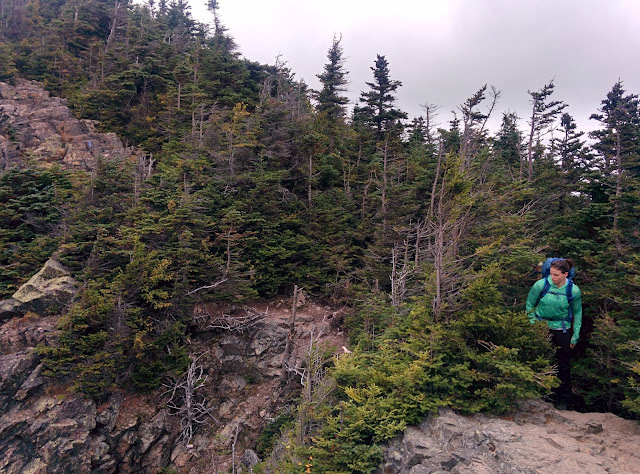 I sought refuge in a stand of short trees, and we darted from stand to stand, over the summit, and across the ridge, dropping down in elevation slightly on the way to Mt. Liberty (4,459'). From there, the wind was still strong, but I couldn't help stopping to stare at the ridges we'd cross over the next two days, Owl's Head right in the middle, and the Kinsmans to the west. After arriving at a small trail sign pointing us in the direction of the Liberty Springs tent site around 2pm, we dropped down a steep 0.3 miles to where we'd spend the night. 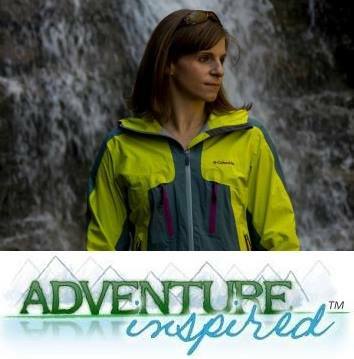 We planned our route based on established sites knowing the rules governing backcountry camping in the area, (no camping within 0.25 miles of any trailhead, hut, or shelter) and the terrain. Space at the campsites is available on a first come first served basis, and we knew holiday weekend crowds could make getting a good spot a challenge. For that reason, we started earlier than we would have otherwise. Platform 10, the last in a line of giant square, flat milled wood structures was our pick, and it was unoccupied when we arrived. (We'd get neighbors around 6:30pm). Our two-person tent took up half of the platform, and we attached the fly to anything we could find so it wouldn't blow away in the middle of the night. We'd also need it to keep the warm air in; temperatures dropped into the 20's. He was very happy to put his pack down for a second, before we started setting up camp! Caretaker Rachel visited us to collect the mandatory $10/person camping fee and gave us some advice about the trail ahead. After a dinner of Mountain House Chicken Fried Rice and Italian Pepper Steak, we dropped our food bag into the bear bins down the path from Platform 10 and turned in, alarms set for 5:30am in preparation for our longest day of the trip. Despite an 8pm bedtime, the 5:30am alarm came too soon. I packed up as much as I could in the tent without extricating myself from my sleeping bag, it was COLD. Mountain House Scrambled Eggs helped. 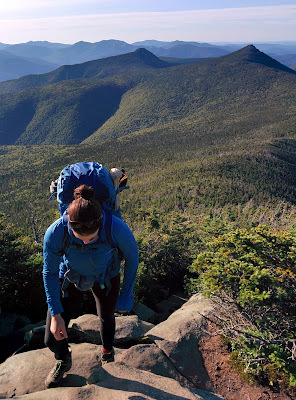 We bid goodbye to Liberty Springs around 6:45am, climbed back up 300' to the Franconia Ridge/Appalachian Trail and turned left, heading toward Little Haystack (4,760'). There wasn't a cloud in the sky, but the wind whipped around us all morning and into the afternoon, making the air feel significantly colder than it was. The 1.8 mile climb between the Liberty Springs Trail junction and Little Haystack kept us in the trees, for the most part, until the last steep push to the wide open summit. Between Little Haystack, Mt. Lincoln (5,089') and Mt. Lafayette (5,260'), you're above treeline on an exposed ridge. It's one of the most spectacular sections of trail I've ever hiked, and it blew my mind for a second time on this trip. On a sunny day, you can see for miles in every direction. But you can also get caught in some serious weather. We were lucky, it was sunny, but it was also incredibly windy. On the stretch between Mt. Lincoln and Mt. Lafayette, I feared being blown off the ridge as I was thrown off balance every time I lifted a foot. I had just about every inch of skin covered and was chilled to the bone. The wind turned my backpack straps into little weapons, and I tried to tuck them in to avoid getting whipped in the face. But the terrain was incredible. 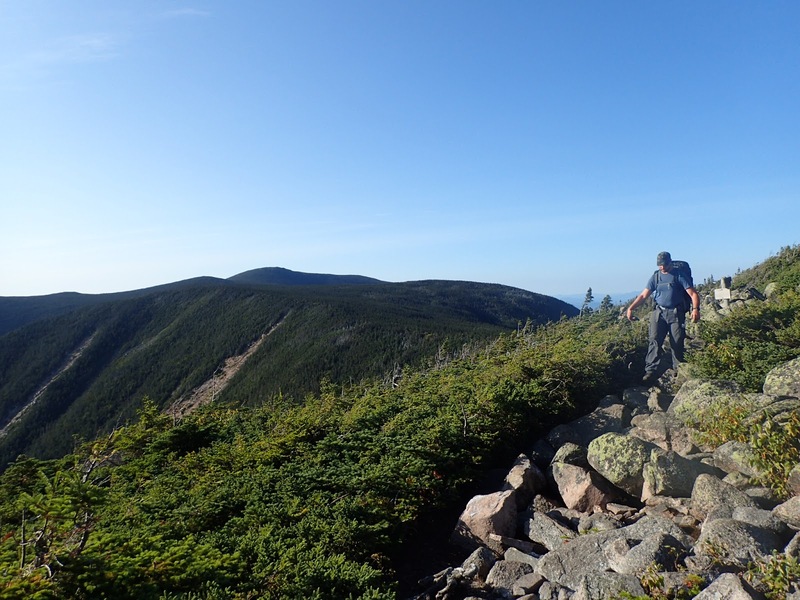 Normally, Franconia Ridge and its summits are absolutely packed on nice days, but thanks to our early start, we only saw a handful of people up there with us. Day hiking crowds also typically head down from Mt. 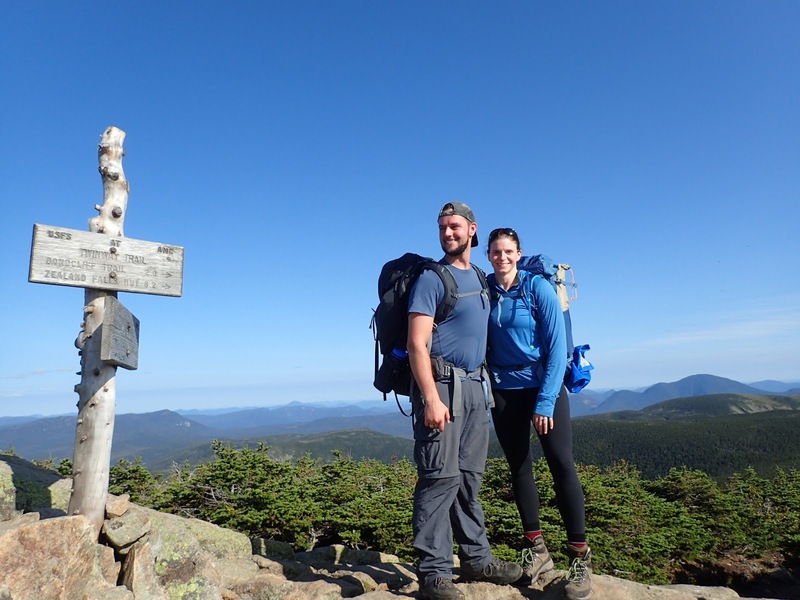 Lafayette; we continued past the summit along the Garfield Ridge/Appalachian Trail toward Mt. Garfield (4,500'). This 3.7 mile section turned out to be a serious challenge, chiefly because of how steep the trail is. We dropped down over 1,500 vertical feet, and I found myself sitting down and using my hands to maneuver along parts of the descent. I kicked myself for not bringing trekking poles to save my knees a dozen times on this trip, if not more. The elevation change as dramatic on the way up Mt. 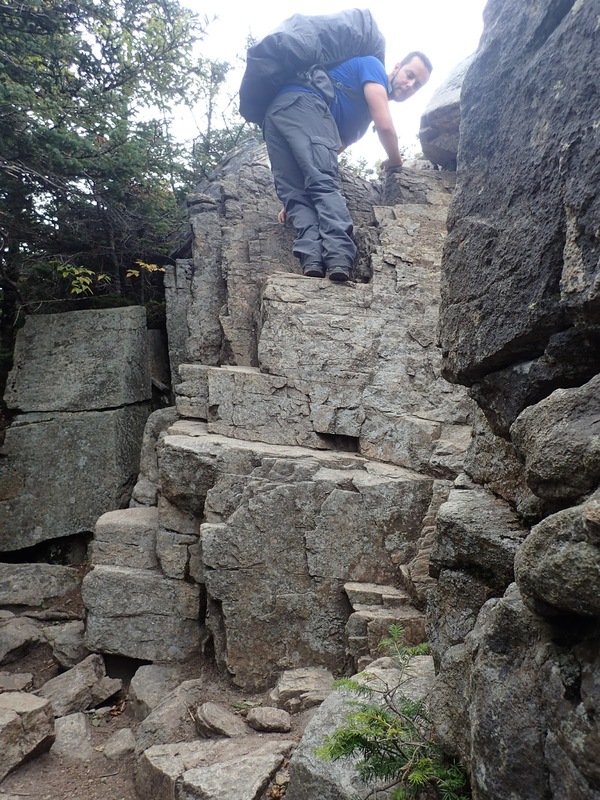 Garfield, requiring huge steps and hand-over-hand climbing beyond Garfield Pond. Yep, that's ice, on the first day of September! Coming down from the top of Mt. Lafayette. But the view at the top of Mt. Garfield was worth it. 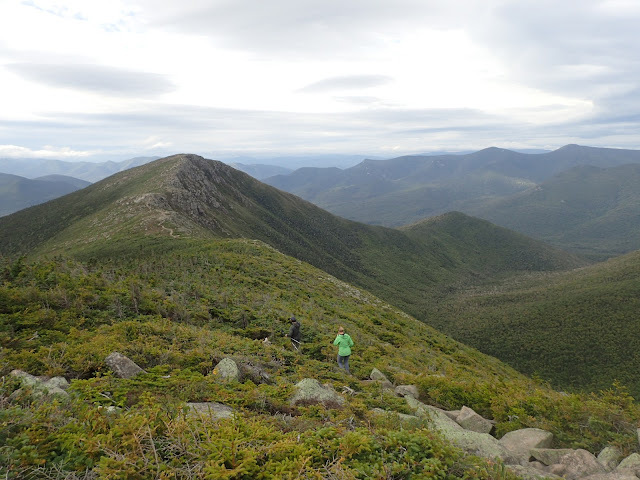 Looking south, we could see the giant tree-covered Owl's Head in front of us, and looking to the southeast, we could see the entirety of Franconia Ridge, which we'd just traversed that morning. We could also see the Bonds, which we'd head for on the final day. After a quick break on top of Mt. Garfield, we made a big push to get to the Galehead Hut, the Pemi Loop's halfway point. The miles were starting to add up, I was in desperate need of a longer break, and couldn't wait to see what baked goods and soup were available that day. The closer to the hut we got, the larger the crowds became, and finally, we made it. Taking a break on Mt. Garfield with Owl's Head right behind Dan, Franconia Ridge in the top right of the frame. I threw off my pack, rushed inside, and promptly devoured a warm bowl of potato dill soup and a pancake brownie. Sitting down on a toilet, even if it didn't flush, felt like a novelty. I'm glad we opted to camp rather than use the huts, but would love to leave the tent at home and use them on a future trip. Plus, hut guests get a multi-course dinner on arrival and a hearty breakfast the next morning! The last part of our day was the toughest mentally; we still had a 1,200' climb up South Twin (4,902'), which proved to be incredibly steep, (something new and different! ), and another 2.5 miles or so before making it to Guyot Campsite, one of the most crowded and popular campsites in the Whites. I took sips of water from my Mazama Axe hydration pack all day, trying to stay hydrated as we made our way up. 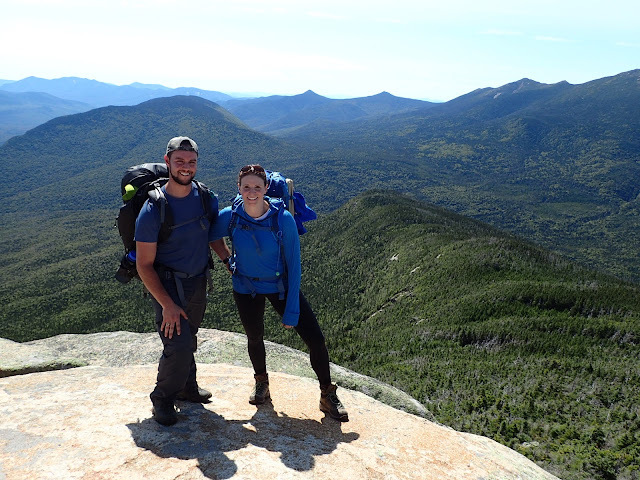 From the top of South Twin, all smiles and ready to get to camp! From the top of South Twin, we got a slightly different view of Owl's Head and Franconia Ridge, but didn't spend much time there. We heard Guyot fills up early, and though a summit steward told us "a good caretaker always finds space for everyone," we were concerned about getting a decent spot to camp after such a long day. Of those we met heading the same way throughout the day, our pace and lack of breaks put us ahead of four groups, but we had no idea what we'd find when we arrived. Our pace quickened across the relatively flat Twinway/Appalachian Trail. The Twinway is above treeline briefly. We passed the summit of Mt. Guyot (4,580'), followed the Bondcliff Trail, and made good time in the trees along the ridge toward Guyot Campsite. After dropping down 0.2 miles to the campsite, we found it already completely full, save a few spots in the Mahoosuc Shelter. I'd never spent a night in a shelter before, and with the prospect of rain the next day, we snagged two spots so we didn't have to set up a tent and take it down in the rain. 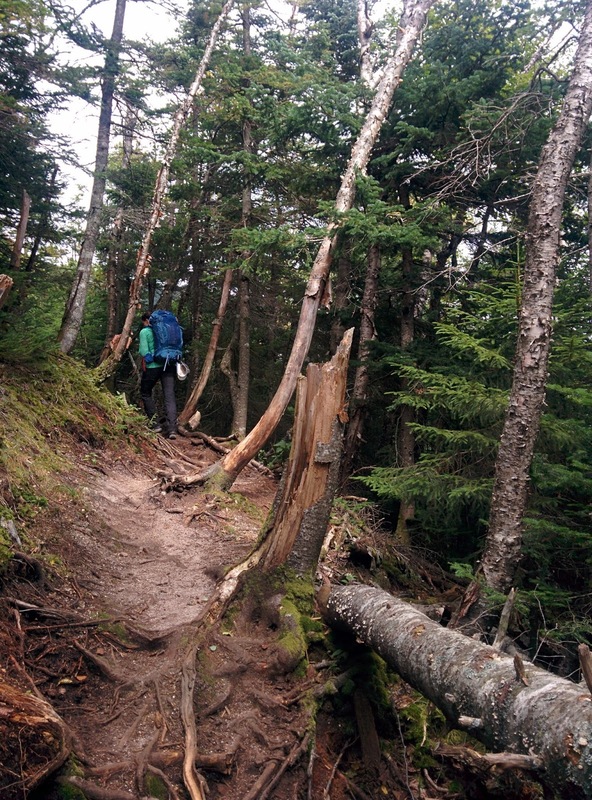 The last beautiful, rugged stretch of trail between South Twin and camp. Groups behind us weren't so lucky; they were stationed at the top of the trail in overflow sites, which meant a 0.2 mile descent and ascent for water and bear-proof food storage. Though the shelter ended up being full beyond capacity, it was fun to sleep in one and get to know some of the folks we'd been leapfrogging with throughout the day. I was concerned about folks staying up later than we wanted to, but by 9pm, the shelter was dark and quiet. It didn't rain overnight and wasn't raining when we woke around 6:30am to head out for the day. I spotted a few tents pitched on inclines in the woods, stepped over gear belonging to folks who had the shelter's patio as their only open sleeping option, and thanked my stars we arrived early enough to snag shelter spots. After another bag of Mountain House Scrambled Eggs, we left camp, giving the caretaker $20 for our campsite fees on the way out. Trying to keep up with a pair of day hikers down from the summit of Mt. Bond, and trying to outrun the rain! My feet, calves, legs, and hips were sore and stiff, making the initial climb out of the campsite and the ascent of Mt. Bond (4,698') painful. The weather held, but didn't look like it would for long, so we pushed on down toward Bondcliff (4,265') with clouds chasing us from all directions. We still got some incredible views, and wind, from Mt. Bond, Bondcliff, and the ridges in between. This exposed stretch of trail was my favorite part of the entire trip, despite the fact that I had to layer up again to keep out the wind. Bondcliff's summit is wide and flat, and though we didn't stay long to enjoy the views, just being out there above treeline on our second exposed ridge of the trip was incredible. 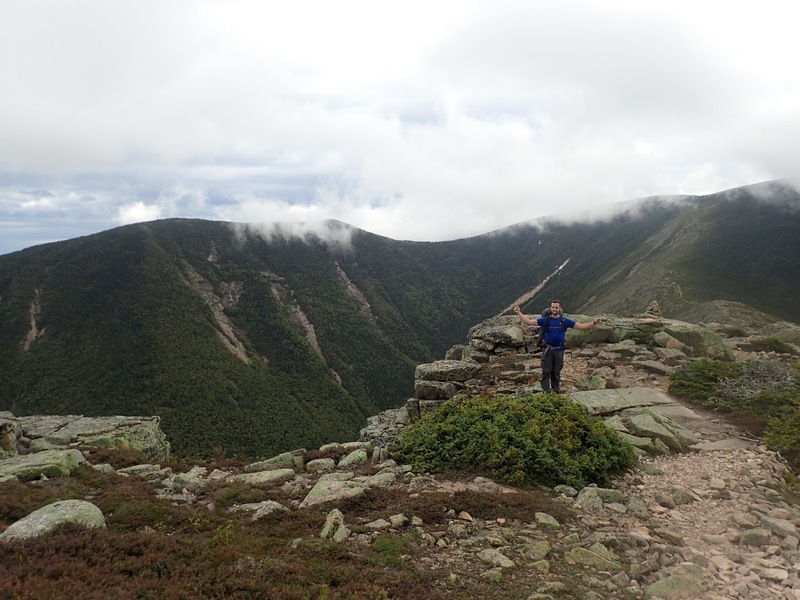 We could see just about every single stretch of trail we'd covered - Franconia Ridge, Garfield Ridge, Mt. Bond behind us - and it really started to feel like we'd accomplished something. Celebrating our last summit of the trip - Bondcliff! A few stray raindrops chased us down yet another incredibly steep stretch of trail into the trees, where we'd remain for the rest of the loop. I'd read the last 8.8 miles back to the parking lot would feel long, and that was an understatement. Though we were either going downhill or on flat ground, it started to feel like we were hiking forever, especially when we got to the Lincoln Woods Trail junction. The Lincoln Woods Trail follows an old railroad bed, so it's completely flat with oddly spaced old railroad ties keeping you from getting into a walking rhythm. It was raining by this time, my knees and feet were screaming at me to stop walking, and when we finally arrived at the parking lot, I almost ran for the car. But we made it. One of the steeper sections, coming down from Bondcliff. for three days, then $10 per person per night for camping. Bring cash with you. Be prepared for crowds. Though good hikes don't come easy, this part of the White Mountains is extremely popular. We heard the record number of people staying at Guyot on one night was in the 90s, and based on my calculations, the true capacity of the platforms and shelter is just over 20. Get to your campsites early, and be prepared to be flexible with the level of comfort of your accommodations. Bring layers and watch the weather. The White Mountains can get hit with some serious weather incredibly quickly. 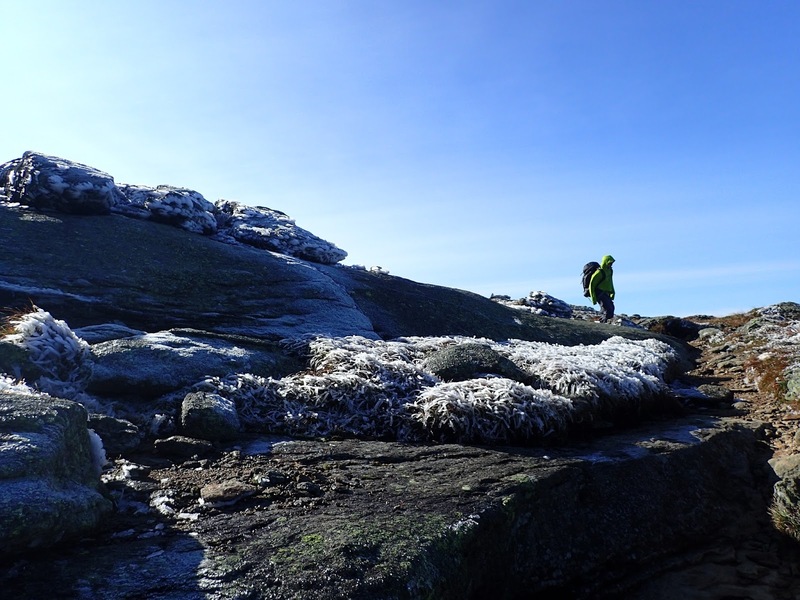 The second highest wind speed ever recorded was on Mt. Washington, which you can see from most of the Pemi Loop's summits on a clear day. Be prepared to manage your body temperature in some pretty nutty temperature changes, and if storms are coming, consider changing plans. Know your options. Depending on your physical conditioning and desire to suffer, I've read it's possible to do this trail as a day hike (!!!) or in two days. We opted for three, but there are multiple ways to space out the mileage for three days too. You can take a longer first day and overnight at the Garfield Ridge Campsite, or follow our itinerary. The weather and your conditioning as well as your pace will all play a role. 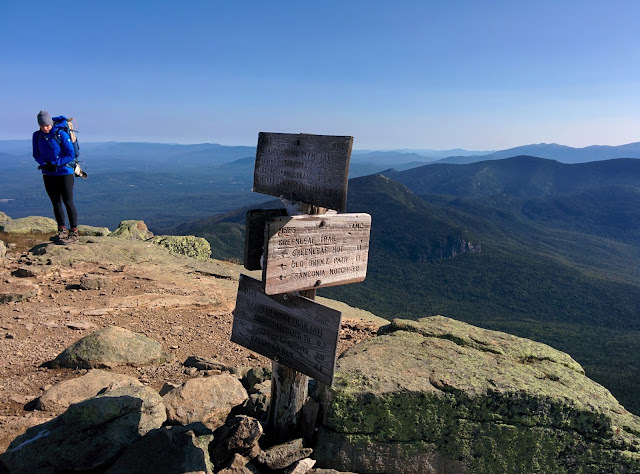 The "full loop" involves tagging additional summits like West Bond and North Twin if you're up for it, but as peakbagging wasn't the point of our trip, we skipped them. For me, the hardest stretch of trail physically was the climb up South Twin after a long second day, and the hardest stretch mentally was the last 4 miles of flat terrain on the way out. That may not be true for you, but thought it was worth noting! Thanks for sticking with me through what's definitely the longest trip report I've published here! I'd love to hear from others who've done this trail and what your experience was like. Please leave a comment!